Recycling. The Steel Recycling Institute (SRI) reports that steel is recycled more than paper, plastic, glass, copper, lead and aluminum combined. 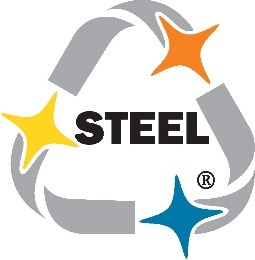 All steel products, including steel framing, contain recycled steel. Steel framing contains on average a minimum of 25% recycled steel and is 100% recyclable at end of life. Using recycled steel takes the pressure off renewable resources: about six scrapped cars are needed to build a typical 2,000-squarefoot home with steel framing. Finally, in contrast to many other building materials, steel is routinely collected in aggregate quantities from construction and demolition sites and recycled into new steel products. Energy and Emissions. Since 1990, the US steel industry has reduced energy intensity by 32% and Co2 by 37% per ton of steel. Globally, the World Steel Association states that world-wide, the steel industry has reduced energy consumption since the 1970’s in the manufacture of steel by 50%. This directly relates to a reduction in greenhouse gas emissions. A Sound Environment. In terms of acoustics, the use of cold-formed steel framing is instrumental in achieving acoustical privacy. Acoustical privacy from one room to the next is a function of the Sound Transmission Classification, STC, of the separating assembly. This assembly can either be a wall or a floor-ceiling assembly. STC is a single number rating system that gives a comparative look at how well an assembly impedes sound energy as it moves through the assembly. Essentially the higher the STC is, the greater the acoustical privacy. A threshold of quality is an STC of 50. The 2012 International Residential Code, IRC, in Section AK102.1 requires a STC of 45. The 2012 International Building Code, IBC, in Section 1207.2 requires a STC of 50.